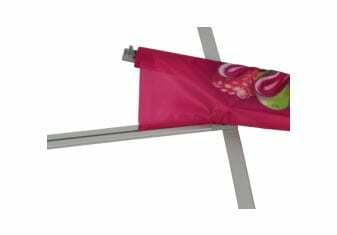 The FLEX-frame banner display system is unlike any other. 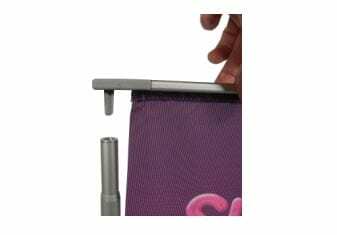 By using different fabrics and prints options, we can use the system to create a single sided banner, a printed through to reverse banner or a true double sided banner where separate prints are seen front and rear.The banners are finished with a plastic extrusion, sewn to the top and bottom of the fabric graphic, which has a cylindrical form. 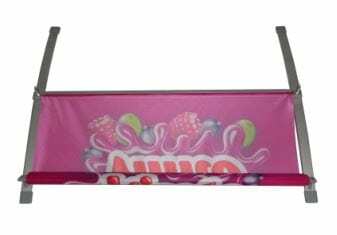 This then slides into a channel which runs through the base and also the top rail of the banner system as shown in the images on the right.The banner is tensioned by satin anodised aluminium telescopic poles which have a twist / lock action. These poles sit on the right and left hand sides of the banners which therefore give the effect of framing the banner, hence the name “FLEX-frame”. This is most unusual for any banner system as typically, the vertical pole supports of banner systems sit behind the graphic. 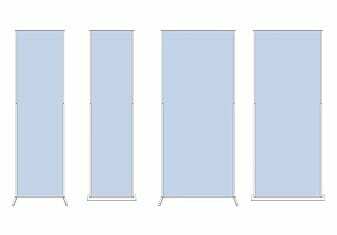 If we were to use a double sided print on a traditional banner system, the rear print would be partly obscured by the pole but with the FLEX-frame system, as the poles are to the side of the print, double sided prints ay be seen from either side of the system – it essentially doesn’t have a pre-defined front or rear side, they are the same. 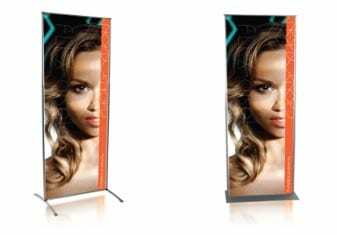 Double sided roller banners as an example, require two separate prints placed on either side of the system with the pole sandwiched in the middle. This gives the banner system significant depth and also a gap between the two graphics when viewed from the side. 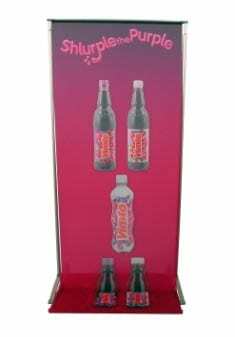 With the FLEX-frame system, it provides an extremely slim-line double sided banner and is very lightweight and portable. Also, as the poles are telescopic, different heights of graphic may be used – so when refreshing the system, a new graphic does not have to be the same as the original. Height can be varied between 1.5m and 2.4m. Both styles are shown above.